Anthony Grant will have a part to play in the Posh push for promotion. Peterborough United boss Steve Evans will stick to the football philosophy which has delivered success throughout his managerial career. And that means thrills, spills, attacking football and great entertainment, but never as a priority ahead of winning matches. Posh manager Steve Evans is a big fan of George Cooper. 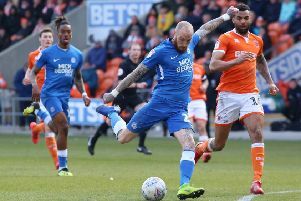 Posh played some decent stuff in their first game under Evans’ care when beating Charlton 4-1 at the ABAX Stadium last weekend, but they followed that up with a grim 1-0 win full of long balls on a treacherous playing surface at Bury on Tuesday. Evans insists the Gigg Lane display was a ‘horses for courses’ approach rather than a sign of things to come. He has firm ideas on how he wants to play. “My mandate at this club is to win matches,” Evans said. “That mandate also includes entertaining football and that’s what I expect my team to deliver, but there are times, like at Bury, when you just have to adapt to the conditions. There are times when you have to pass the ball and there are times when you just have to battle. We might get outplayed occasionally, but we must never get outfought. “I encourage passing football, but I like to see it in the final third of the pitch rather than the first third. “You can make 400 passes in a game and not win it. I like to pass with a purpose, rather than pass just for the sake of it. “And we have so much attacking quality why not get the ball to them as quickly as possible? That doesn’t mean by using long passes. It would be silly to use the likes of Chris Forrester in that way. “I’m confident we will have thrills and spills galore until the end of the season. I have been blessed to inherit a dressing room full of gifted attacking players who are guaranteed to entertain. We have 10 huge games left and we might have to play differently in all of them. “I might tweak the formation and a couple of players for the game at Oxford on Saturday as it will be a completely different sort of match. “Oxford play decent football. I watched their game last weekend at Wimbledon and they were the better team until losing to a late sucker punch. “They will be well-coached and well-drilled by Derek Fazackerley so we will have to be well prepared ourselves. “I’ve got a good squad here, some of whom we haven’t seen much of yet. I had a long chat with Anthony Grant the other day regarding my need for him to pass the ball on quickly and he will come again. “I’m also excited by the improvement I’m seeing in the likes of Jermaine Anderson, George Cooper and Junior Morias. George destroyed my Mansfield team playing for Crewe earlier this season so I’m keen to see what he can do for us.